Info: Created on 24th January 2011 . Last edited on 18th February 2011. Yes, I agree. Well done! This is so impossibly impossible. I think the tail of the R could be slightly thicker but the rest of the letters are totally awesome. I love M, W and X. Fully agree with 3moDuDe on beefing up the tail of your R. (Damn, 3mo, I don’t mean to be agist, but let me say you have a very discerning eye for such a young guy!) I think it should optically match the weight of your “vertical” strokes. The Ww do work, but this particular solution always feels forced to me. The rest is breezy and elegant, so maybe some more “diagonals” like your Vv will improve things! Great job! 10/10 for usability and your smile-inducing sample. Thanks for all the compliments guys...I really appreciate it. I'll play around with your suggestions and see what I can come up with. Updated the R, added a -. Congratulations! FontStruct Staff have deemed your FontStruction worthy of special mention. “Obleak” is now a Top Pick. Love the @, which I just noticed. Well done on the new R. I like the first alternate best for the new w, and they all work well in their own ways. I am warming up to the capital W. It actually looks quite dashing in its constructivist sensibility, especially in all caps settings. I really do love the tail of the Q, but it feels a bit too prominent. Could you include some alternates? Hey, maybe it could take a cue from the original R? I am not sure how to fix it, but the character is intriguing and I am also really interested in seeing how it looks with the current tail shifted all the way to the right. Do you mind indulging this request? This fontstruction is really superb! Thrilling when such a breezy work results in such a satisfying and highly usable result. Far more sophisticated than it appears, and all a testament to how well-executed and consistently formed are each and every vertex. 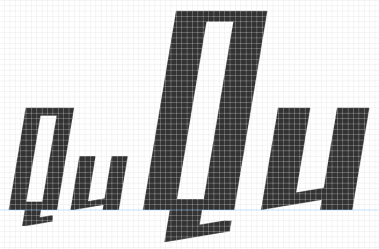 With this highly effective and attractive slanted rectangle scheme, I anticipate that you can push the character set well beyond the latin block, and really as far as anyone ever has in a single fontstruction (or better yet, pro font you derive from this sketch) — and still produce extremely satisfying results. This is the power of fs 2.0 when it comes to an angular scheme as flawless and flexible as yours. And that’s not even the start of it, because with shocking ease, you can then iterate a family of widths from extended versions to one a degree, i believe, more condensed. Fresh! Just like your design. Congratulations! @will.i.ૐ Wow. Thank you for the compliments and suggestions. 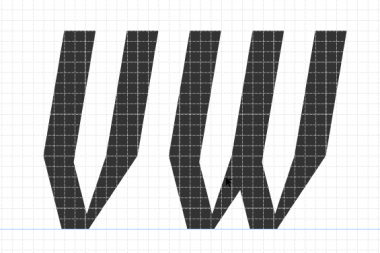 I'm still toying with ideas on the w and plan to try them on the W as well. What do you think of the alternate Qs in the pic below? It's just a screen capture from the editor previewer, so the lines are a little off. I used the right leg from the current R. Do you think it's too wide for the tail of the Q? Yeah, I don't know what happened. I'm trying to get meek's attention to see if he can restore it. I like this one. I saw this one yesterday and was unable to comment. 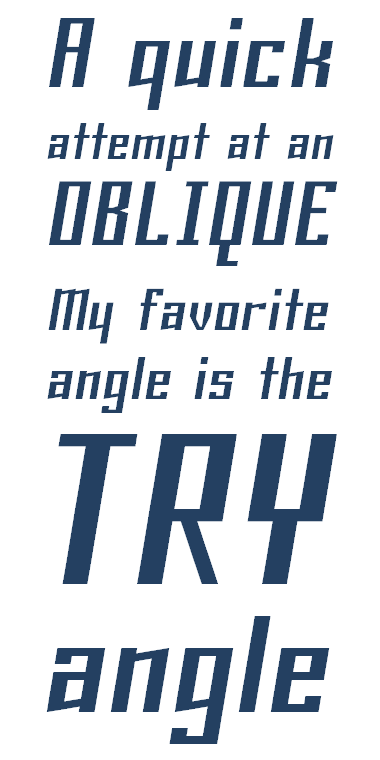 When I viewed with a sample text it looked superb. Ok, I think everything is fixed, but the editor is still acting very strange...I think I will wait a bit before I try anything else on it. I like this. use in a movie then I like better. A few suggestions for the V, W & Q. Great suggestions coming from djnippa! I say the VW he offered are perfect. His Q has a compelling idea in referencing the u’s sloping bottom. As for your Q samples above, I think the second one works best. All three of them still feel disproportionate to me. Nippa smartly resolved the prominence issue by making things vertically compact, whereas I was thinking the thinness of the original R’s leg could offer a similar improvement. If you try out this tack, I expect a more or less centered one like #2 above will work best. That said, I also want to see one like #3 with a thin tail, keeping the left side of the stroke in the same position while nudging the right side of the tail that one brick or so difference toward the left. I agree with elmoyenique, but I'm not too sure what grid size you used, so I cannot suggest, if I think there is a better alternative. Above are the two size variations I used in my previous examples. Thanks elmoyenique and djnippa for the feedback. I used a slightly small grid size than your samples, nippa. I'm gonna see what I can come up using your ideas. Very nice fs, aph. So controlled. Which is what I liked about the first iteration. Even though the current V and W look more V-ish and double-V-ish, they break the cadence of the up-down movement of shapes, even look tilted in the wrong angle. I like dj's last image. It looks like these V and W might not disturb the rhythm of letters. Also, this same image looks like suspended animation. I would love to see these letters scrolling along the grid. 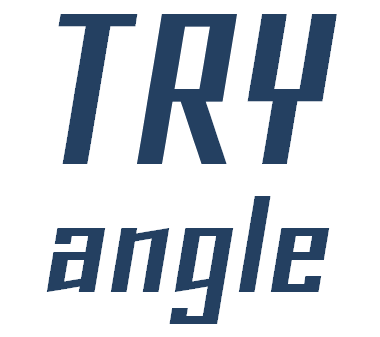 Additional things to consider: J might benefit from dipping down the baseline at an angle, like the right stem of dj's V; I think there's enough height in the letters to give S and Z the slants they scream for; same for 7 to blot out the empty space in the lower left quadrant. However! I always start off with these simple modifications myself and end up making a mess. I have so many complete but unshared fs'es because I tweaked too much. Don't do anything I say unless you are really feeling it. 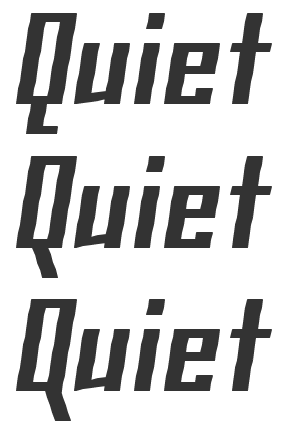 New J, Q, g, j, and y with slanted descenders. I saved the original J and Q as alternates, but not the j, g, and y.
I'm still pondering the V and W...and now the S and Z as thalamic suggested. Congratulations! FontStruct Staff have deemed your FontStruction worthy of special mention. “Obleak” is now a current Featured FontStruction. Wow meek, I'm very flattered. A very nice slanted typeface on such a small grid: the Featured FontStruct pick is well deserved! I would just suggest you to double-check the letterspacing of some gliphs (e.g. j, k, g, T and X) that look inconsistent among the others. Congrats for the Featured Fonstruction! Oh wow. 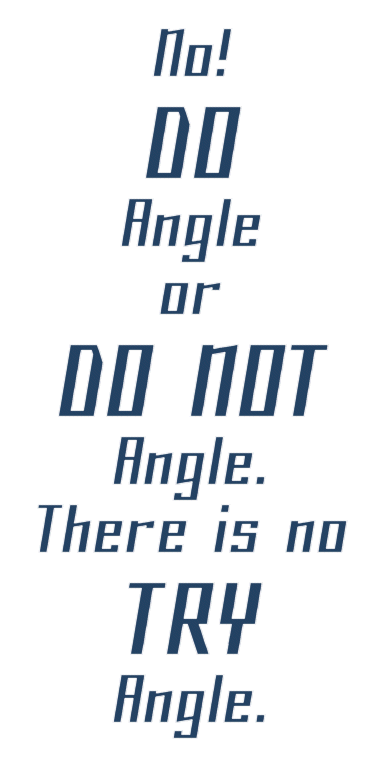 I was looking at the first picture thinking of a deeper meaning when it actually just says triangle. Anyways, nice font. Very uh tryangular. Whoops, it totally messed up the ASCII spacing. @BanjoZebra The current y does have the tail that you are talking about, I think. Some of the samples show previous versions of the y that did not have it.